Listen to a new conversation on the evolving relationship between business and human rights as we approach our upcoming two-day event in London. 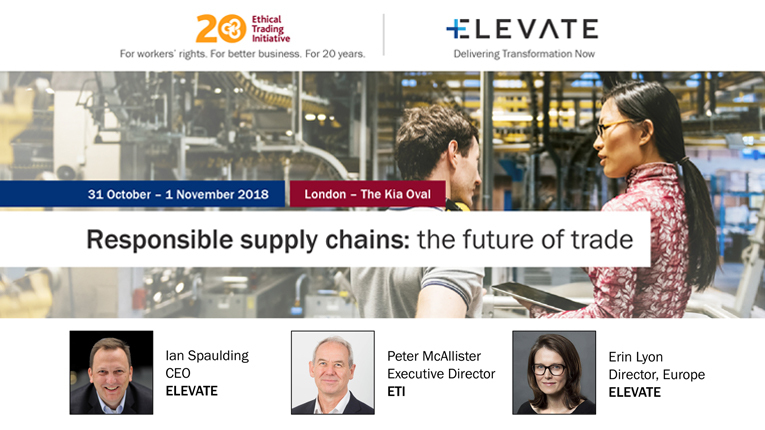 With 5 weeks until Responsible supply chains: the future of trade arrives at the Kia Oval in London, ELEVATE CEO Ian Spaulding and ETI Executive Director Peter McAllister discuss current trends at the intersection of business and ethical trade; their predictions for the future; the impact of Brexit, and preview some of the highlight sessions at the upcoming conference. Disruption – In the uncertain climate dominating the trading landscape, what will the winners be doing differently, and what are the catalysts for success? Will workers bear the brunt of Brexit and new global trade wars? Legislation – What effect are new legal requirements having on senior execs and investors? Supplier ownership – How are progressive suppliers changing the ethical trade dynamic? Metrics – What does the data tell us about the changing nature of factories and their ability to improve? And how do we ensure that the concerns of workers are at the heart of companies’ response?